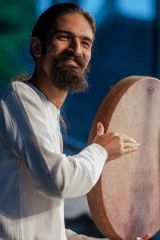 Mehdi Darvishi, born in 1981 in Karaj,Iran,is a player and teacher of Iranian percussion instruments. He started learning music since he was 15 years old. After plying � Setar � for a short period of time, started studying and playing � Daf �. Mr. � Arash Zanganeh � was his first teacher which greatly affected his outlook to this type of music. He furthered his Daf knowledge and skill with renowned maestro� BIJAN KAMKAR �. Also, acquired playing � Tonbak � with famous Maestro � NAVID AFGHAH � which has been very influential in his Tonbak playing techniques. Since 2002, he has started teaching Daf music. As, Maestro BIJAN KAMKAR has acknowledged, some of his students are now teaching music in Tehran and Karaj as well. He has recently settled down in the USA,New York to continue his Daf music performance and teaching.